Bayfield Foods is a cooperative of farmers and food producers located in Ashland and Bayfield Counties along the south shore of Lake Superior. With 19 members we provide our customers with a full range of healthy food products including meats, fruits, breads, vegetables, and value-added specialty foods like cheese, jams, breads, wines, and lacto-fermented veggies. Scroll down to learn more about each of our producer members. The Bayfield Apple Company has been growing apples, pears, cherries and currants for 20 years in our orchards in Bayfield. We are the regional supplier for locally grown jams, jellies and ciders. These fruits are grown under the farm practice of combining integrated pest management with organic fertilizers to produce healthy fruit without toxic chemicals. We hand harvest our crop with a crew from the area and after harvest, we process our fruit into products on-site. From here, the fruits go to regional grocers in Duluth and the Twin Cities, or they’re sold through our web site or our new store. Bayfield Apple Company is the primary location for packaging and aggregation of the CSA fruit share. 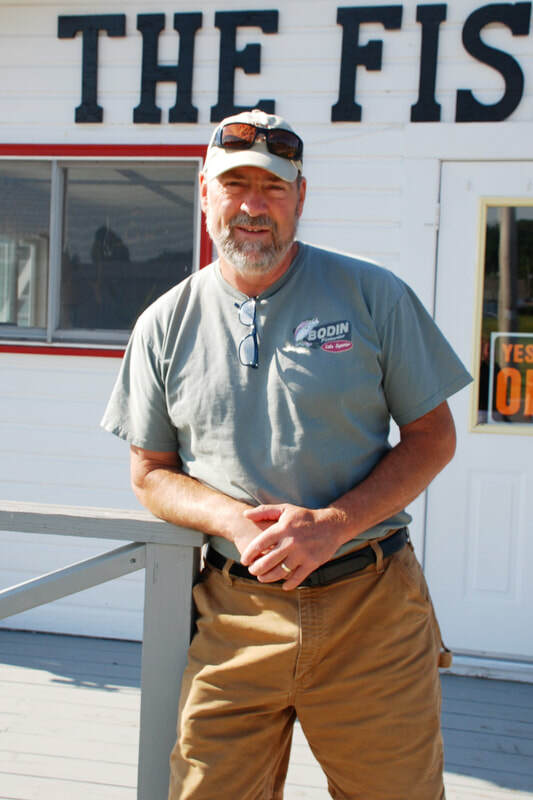 Bodin Fisheries is a family owned wholesale fish house located on the commercial fish docks in Bayfield, WI. Currently being managed by the 4th generation, Bodin Fisheries is renowned locally and regionally for its high quality fresh, frozen and smoked Lake Superior Whitefish, Trout, Herring, and Burbot. We are proud of our energetic employees and die-hard fishermen, who fish in tugs out on the big lake as long as there is open water and who fish through the ice during the cold winter months. Our Lake Superior Whitefish and Lake Trout are pin-boned, filleted, vacuum-packaged individually, and frozen while fresh in our dockside facility. Bodin Fisheries is HACCP certified and a member of the Wisconsin Travel Green program. Great Oak Farm is a 60 acre, UDSA Certified Organic farm in the beautiful rolling hills just south of Ashland, WI. Founded in 2009 and formally certified as Organic in 2011, we grow about 10 acres of delicious vegetables for your CSA boxes. Our main veggie crops include tomatoes, onions, carrots, beets, sweet corn, broccoli, spinach, cucumbers, winter squash, peas, green beans, and cabbage. In order to get a jump on the short growing season here in the Northland, many of our crops are started in our heated greenhouse, then transplanted into one of our unheated hoop houses in the spring (often while there is still snow on the ground!) Then, to keep CSA boxes full through the long winter months, we store many pounds of veggies in our old-fashioned root cellar. The farm is also home to a small flock of 100% grass-fed sheep. From our wood heated, straw bale house to our Organic growing practices, we are deeply committed to sustainable living and restorative agriculture. Thanks for making us your farmers! 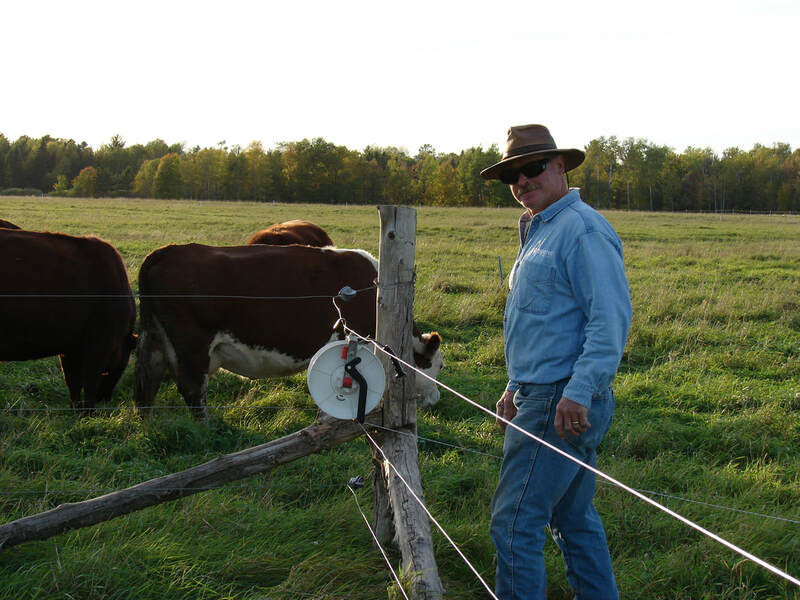 The Griggs Cattle Co. produces quality, grass-fed, organically-raised beef cattle using rotational grazing practices that comply with organic certification requirements. We began operating in late 2009 and became a beef-producing member of Bayfield Food Cooperative January, 2013. Our primary mission in this life is to produce healthy, naturally raised good tasting beef products. We take great pride in our role of producing quality beef naturally raised, never fed grain, never administered hormones or anti-biotics, and in our method of farming with good conservation practices. We invite every customer make arrangements to come pay us a visit at the farm and walk the ground where your beef comes from. We expect you will enjoy the walk and will enjoy our beef products often. Thanks for being our customer. Happy Hollow Creamery is a small farmstead cheese operation located in beautiful Bayfield, Wisconsin just a few miles from the shores of Lake Superior. We are producers of sheep cheeses hand-made in small batches and aged in our small state-licensed on-farm cheese plant. We are based on a 162-acre family farm equipped with a nearly one-hundred year old dairy barn. The farm has been in the family since 1972 and we have been producing cheese here since 2011. We milk East Friesian/Lacaune dairy sheep seasonally, April-October, and market our cheeses locally. Our sheep spend their summer days on our green pastures and are rotated using a management-intensive grazing system. We aim to provide our animals with a healthy sustainable environment, produce high quality cheeses, and continue in the tradition of small-scale farming. The Hausers have been in Bayfield for over 100 years. In 1928, during the depression, apples were a way to make extra income and the Hausers acquired the original “Knight” orchard with trees that still produce today. The farm is now operated by the 3rd, 4th, and 5th generations and has approximately 30 acres of trees with a wide variety of delicious Bayfield apples.In 1988, the “Red Barn” jam kitchen opened, making delectable delights including raspberry, blackberry, blueberry, strawberry, and cherry jams as well as fresh apple butter every season. Every item is homemade and locally grown! Heritage Acres is located in Butternut, WI where we strive to raise meat products that have been naturally and ethically raised. The quality of meat that comes from the animals raised on our farm is superior to anything you can buy in the grocery store. The beef, pork, lamb, and poultry we raise are all considered “heritage breeds,” hence our name, Heritage Acres. These breeds are animals that were traditionally raised in yesteryear. These animals are superior because they are naturally resistant to parasites and diseases, which in return mean these animals, are not injected or given sub therapeutic antibiotics or hormones. The heritage breeds instinctively graze and forage well on pasture, which means this meat is higher in nutrients, vitamins, and essential fatty acids due to a balanced diet. The sustainable natural methods in which these animals are raised leads to a higher quality meat that is well marbled and full of flavor. Our cuts of meat are tender, juicy and flavorful. Hidden-Vue Farm is a 600 acre beef farm specializing in raising 100% grass-fed Devon cattle. 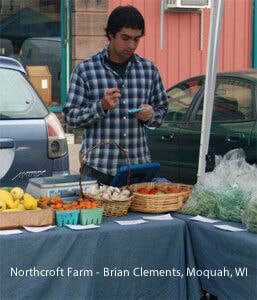 The farm is managed by David Nortunen and is located in Northern Wisconsin not far from the shores of Lake Superior. The farm has been in my family for four generations and over 100 years. Our animals are raised organically (not-certified) without antibiotics or growth hormones. They are pasture raised, 100% grass-fed, and do not get grain of any kind. Our meat has been independently tested and has more CLA, Omega 3 and Beta-carotene than grain-fed beef. Rest assured when you buy Hidden-Vue farm beef, you are buying safe, healthy, nutrient dense, flavorful and tender beef. A unique part of the Bayfield experience for more than thirty years, Highland Valley Farm was established when we settled near Bayfield to raise a family in 1977. We brought our knowledge of beekeeping and honey production, and were introduced to raspberry horticulture by our Bayfield predecessors. We pioneered Bayfield blueberry production by establishing the first commercial planting of newly developed winter-hardy blueberry varieties in northern Wisconsin. The production of black currants and maple syrup are our most recent enterprise additions. Over the years, we have been recognized for our efforts in promoting sustainable agriculture, our stewardship of the land, horticultural innovations, and superb products. More recently, all three of our adult children have returned to partner with their parents in the farm venture. Our family enjoys sharing the beauty of Bayfield and the bounty of our crops with the many people who visit Highland Valley Farm every year. Come out to the farm and pick-your-own raspberries and blueberries during our summer harvest or reserve a 10 lbs box of frozen blueberries to be picked up in the fall. Orchard sweet honey and maple syrup are sold out of our shop as long as supplies last. Maple Hill Farm LLC, founded in 1995, is a solar powered family farm that produces a variety of sustainably raised farm products. Providing a local source of quality sustainably grown and raised products is our mission. We have been in the business of raising hogs since 1995 and take great pride in raising top quality pork under the most natural conditions. To provide the best quality pork we raise our hogs from farrow to finish. Our hogs are pastured, allowing them access to feeds grown on the farm and they have continuous access to fresh air, shade and water. We grow much of our feed, and our purchased feed is specially prepared and do not contain any sub-therapeutic antibiotics, animal by-products or growth hormones. Customer feedback on our pork is always extremely positive. We also raise tomatoes and peppers in our 25 x 95ft greenhouse. 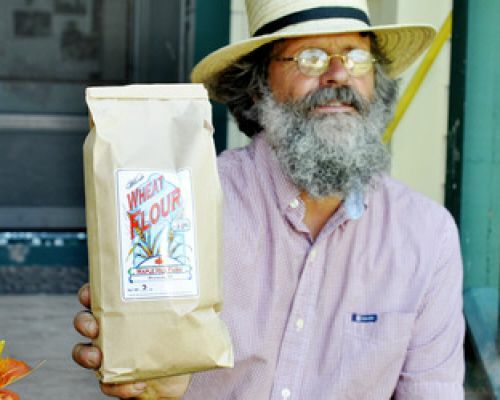 Maple Hill Farm is known for it’s whole wheat and rye flour that is grown and milled on the farm. We also sell pancake mix made from our flour. In addition, handcrafted soaps and handmade wool wear are available in our on-farm store. Moonlight Meadows, LLC believes farming is a way of life. On our farm, we embrace this lifestyle for the health of our family and our community. Moonlight Meadows, LLC isan organic grass-fed beef farm nestled in the heart of the Marengo Valley. Our farm has a rich family background including four generations of farmers (and counting!) who have nurtured the land and tended the animals so all will be available to future generations.Moonlight Meadows takes part in and embraces many different conservation practices for healthier wildlife, cleaner water, and to give back to the land what it gives to us. 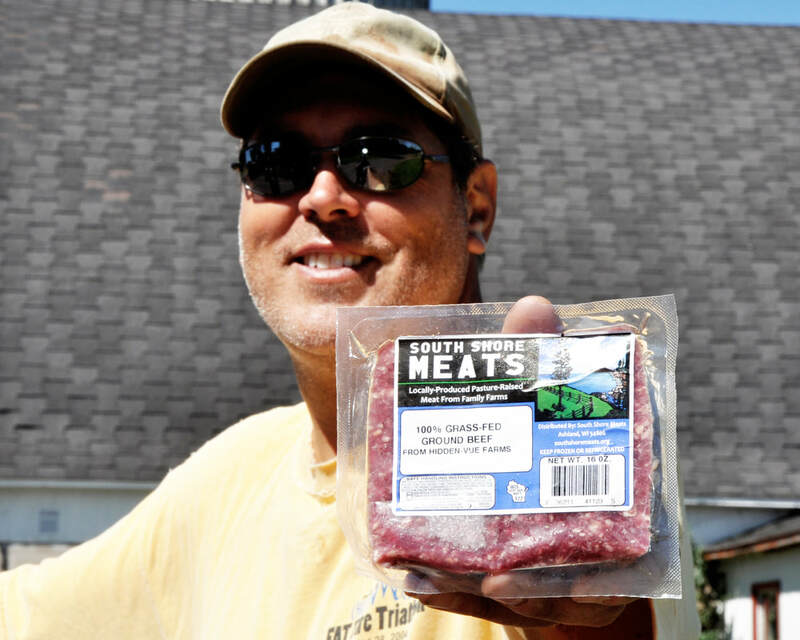 Moonlight Meadows offers a full line of frozen meat products to costumers year-round. We would like others to have the same access to healthy, nutritious foods as we do here on our farm. Local, organic, grass fed beef is a cut above the rest! River Road Farm is a small diversified vegetable farm that utilizes high tunnel greenhouse structures to produce high quality produce through all four seasons of the year. Our specialty is frost-sweetened greens grown in high tunnels during the late fall and early spring. Established in 2011, River Road is continually refining crop diversity and production techniques. We are proud to be supplying many of the vegetables in the Lake Superior CSA boxes and wholesale delivery routes. We follow in a rich tradition of organic and biodynamic production methods and never use synthetic pesticides, fungicides, or insecticides. Living Soil = Lively People! Spirit Creek Farm is run by Andrew and Jennifer Sauter Sargent and was established in 2007. We are a solar powered small family farm/ business on the shores of Lake Superior in Cornucopia, Wisconsin specializing in making traditionally fermented sauerkrauts and vegetables. We practice sustainability by working with the land, collaborating with local farmers, bringing good healthy food to people and raising our children as stewards of the land. Kathy is known throughout the Chequamegon Bay region for her wonderful vegan baking. The breads are amazing and the crackers, granola, and tasty treats are simply divine. Kathy operates her bakery in Bayfield, WI and is proud to provide the baked goods for the CSA Bakery Shares. The focus of our production gardens is to grow veggies that are chemical-free, nutrient-dense, and delicious. We specialize in growing lettuce, tomatoes, garlic, shallots, and daikon radish. We are managing our “wild” apple orchard for cider fruit production. We are grateful and proud to be part of northern Wisconsin's local food movement. Thank you to all of our customers. Established 1996. Just 35 miles east of the Twin Ports, in Iron River, Wisconsin, White Winter Winery and Distillery produces high quality hand crafted Meads (honey wine), Brandy and Hard Cider using locally produced pure Wisconsin honey and fruit. Mead is the oldest fermented beverage in the world but relatively unknown in modern times. We believe strongly in using what is in our own back yard and have built our business on this sustainable practice. We are truly a regional winery using ingredients grown within approximately 150 miles of the cellar whenever possible. We use what our neighbors produce to make a great product. It helps them, it helps us, it's environmentally and ethically sound, and you, the consumer, know exactly what you are drinking, where it comes from, how it's made, and that every purchase stays in the community and supports a family farm (and winery!). Stop in for a sample, a glass, a bottle or a case, take a tour and relax! Not in the mood for wine? Try one of our non-alcoholic fruit spritzers! Great for the kids or if you are on the road. Look for our fine products at a retailer near you. Established in 2004, Wild Hollow Farm is a 40 acre family farm located ten mile south of Ashland, Wisconsin. We grow a host of crops on our farm, including vegetables, cut flowers, currants, raspberries, hazelnuts, pastured poultry, and pigs. We are proud to provide the Lake Superior CSA with fresh-cut flower shares beginning in 2017. We grow nearly a hundred varieties of annual and perennial flowers, each carefully chosen to offer our customers a unique array of colors, textures, scents, and forms throughout the growing season. With four little ones running around and a deep respect for the natural world, we strive to grow all of our crops and animals without the use of chemical aid. Yoman Farm is a vegetable farm run by John Adams about a mile outside of the city of Washburn up on the Bayfield Peninsula. I use organic soil amendments and organic growing techniques on three acres of crops. Horses are pastured on the farm as well and make up the foundation of the soil fertility. I grow about an acre of potatoes for the CSA through the fall and winter and lesser amounts of other vegetables during the summer. I am very happy to be a part of Bayfield Foods and thank you to all our great customers!